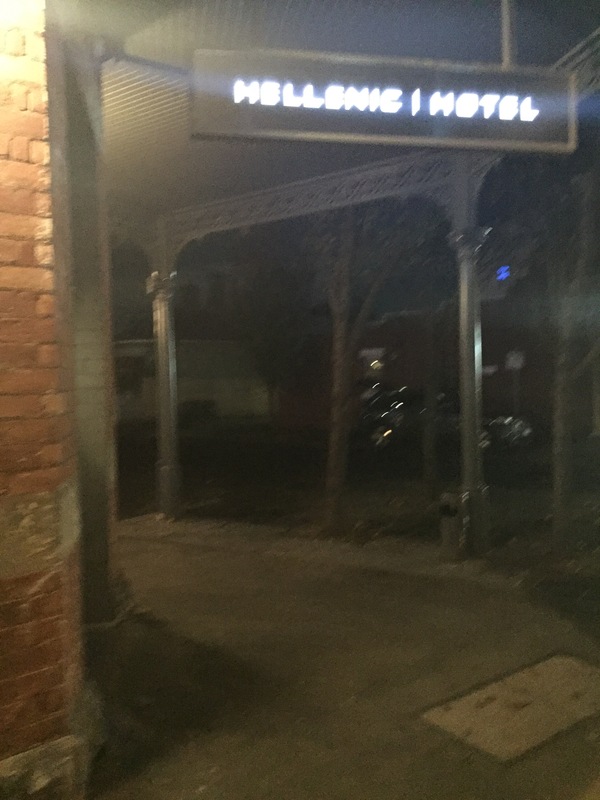 Being avid fans of the Brunswick restaurant we were very excited to get a look inside and taste the food. The earliest we could get a booking was at 5.30pm for dinner on the second day open so we eagerly arrived ready for our very early meal. 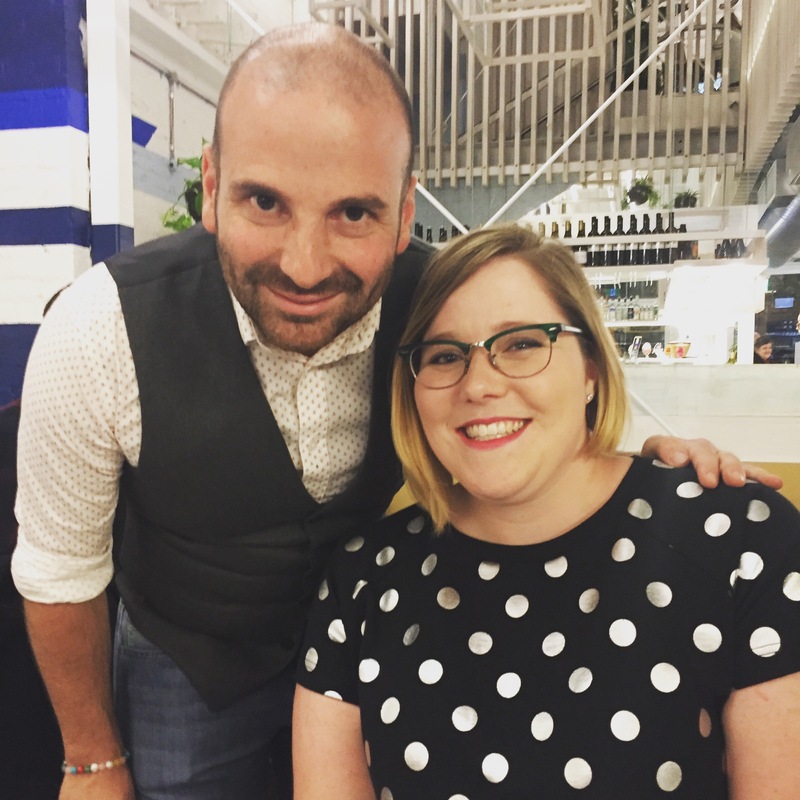 George Columbaris is a celebrity chef, possibly best known for Masterchef which keeps us glued to our screens, but also for a host of great restaurants like Gazi, The Press Club and Hellenic Republics in Kew and Brunswick. We were thrilled when we found the man himself welcomed us in the door, and came over for a chat with our meal. He’s a great bloke and a wonderful chef, everything we thought of him on screen was true to life. George was charming and warm, generous with his time and impeccable in his customer service. Scroll down to the bottom of this post and you might even come across an elusive picture of frenchtoatsandindiepop herself unable to contain her delight at the meeting. 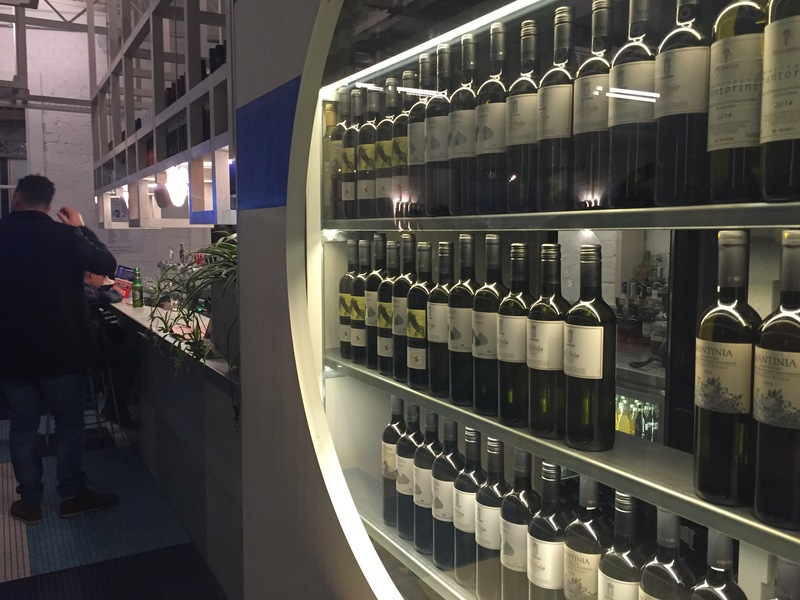 The Hellenic Hotel itself has the feel of the other Hellenic venues with its own unique twist. Think the relaxed vibe of Williamstown with the funky edge of Brunswick. The sports bar upstairs just adds another feather in it’s cap. Who said pub food had to be boring? 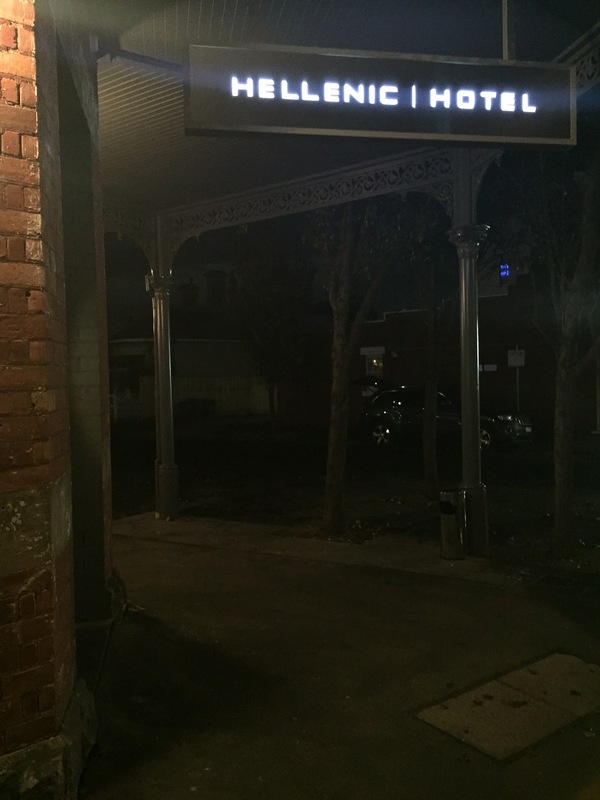 Another huge tick for the venue was the great cocktail prices. 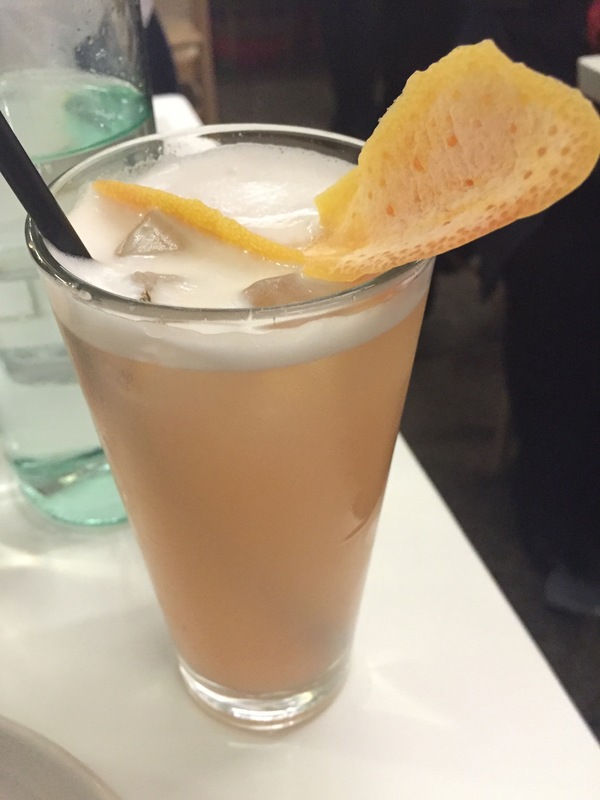 The Diamond vegan fizz, a tasty and fruity combination, will only set you back $12. As we always do, we went for a collection of dishes to share, opting for a taste of everything to make the most of the choices on offer. Some things never change though, when there’s Taramosalata on the menu we will order it. It’s the combination of hot, a little charred pita with the salty, creamy dip that ignites the soul and cannot be ignored. 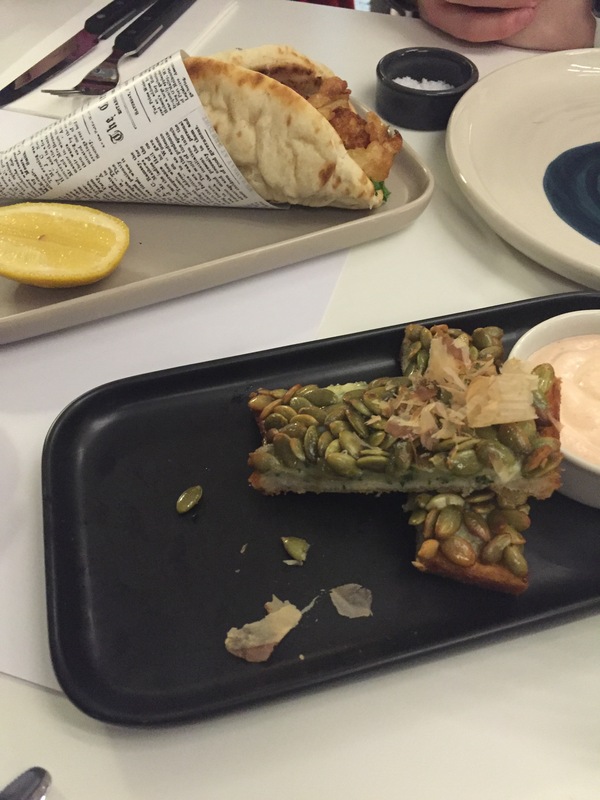 We also tried the Prawn Toast, served topped with pumpkin seeds and with a spiced taramosalata. It was the crunchy seeds really made this dish special, with the touch of warmth and the lightness of the toast. We also tried the Lambs Brain Souvlaki. Yes you read that correctly. 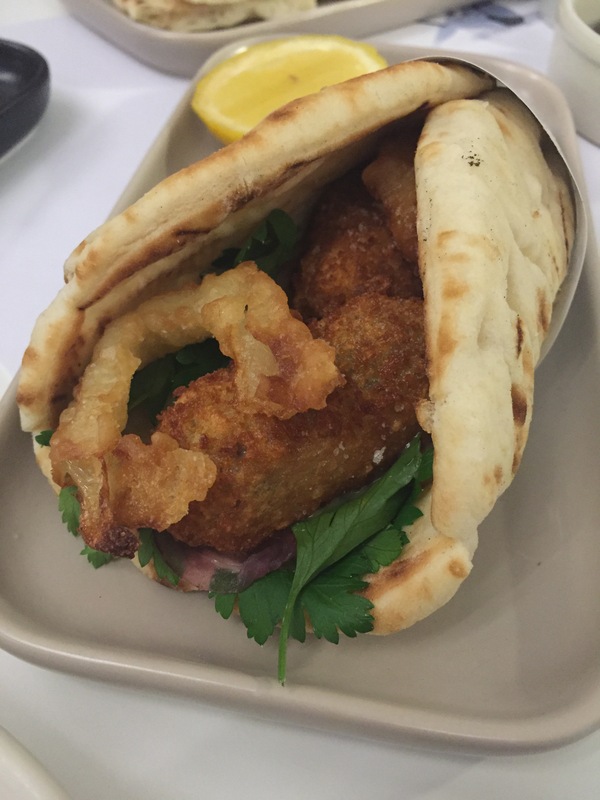 A nod to the hotels history (lambs brain was a signature when they opened) Hellenic has added their own Greek twist by crispy frying it into a souvlaki, wrapping it up with onion rings, salad and aioli. The combination of flavours was perfect, the tangy aioli really bringing the dish together and you wouldn’t be aware you were eating lambs brain were it not on the menu. It’s a nice creamy texture, meaty and crispy and well worth trying if you can get past the fact that you’re eating brain! For us the mains at Hellenic will always be about the meat. 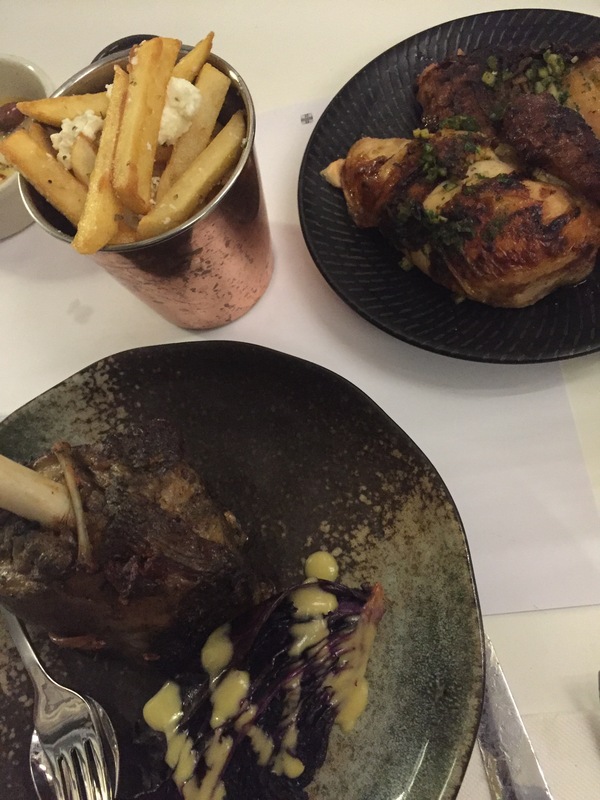 This time we went for the Rotisserie Chicken and the Lamb Shoulder. They were both excellent choices, deliciously tender, juicy and falling off the bone. We accompanied the heavy serve of protein with Onion Rings and a Herbed Fries with feta. 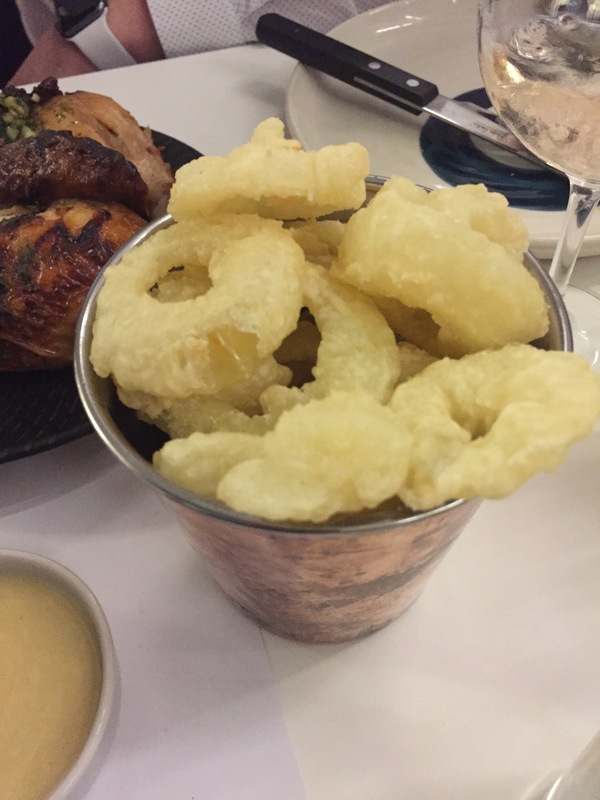 While blond, the onion rings were well cooked and well seasoned. If only they were a little more golden it would have been perfection itself – light, salty and easy to eat by the bucketload. 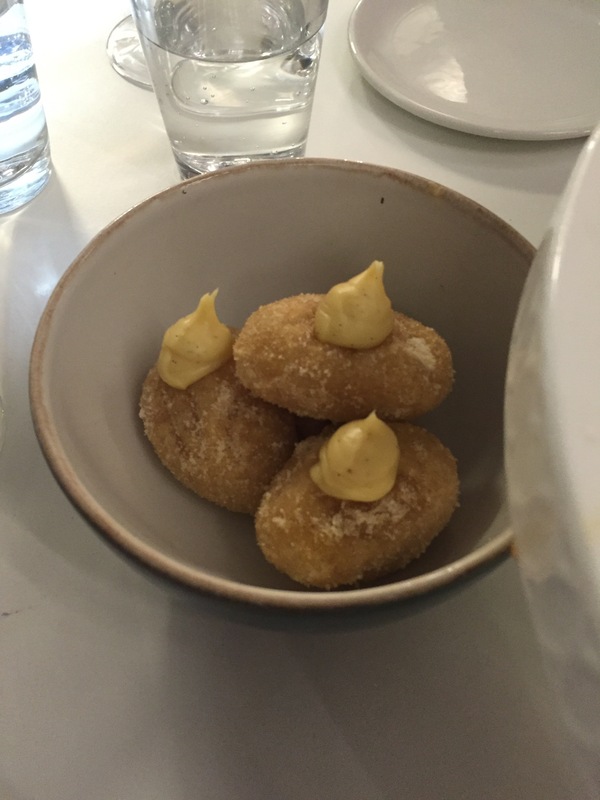 We enjoyed the little doughy ball of deliciousness (otherwise known as Loukomades) served with a passion fruit coulis. 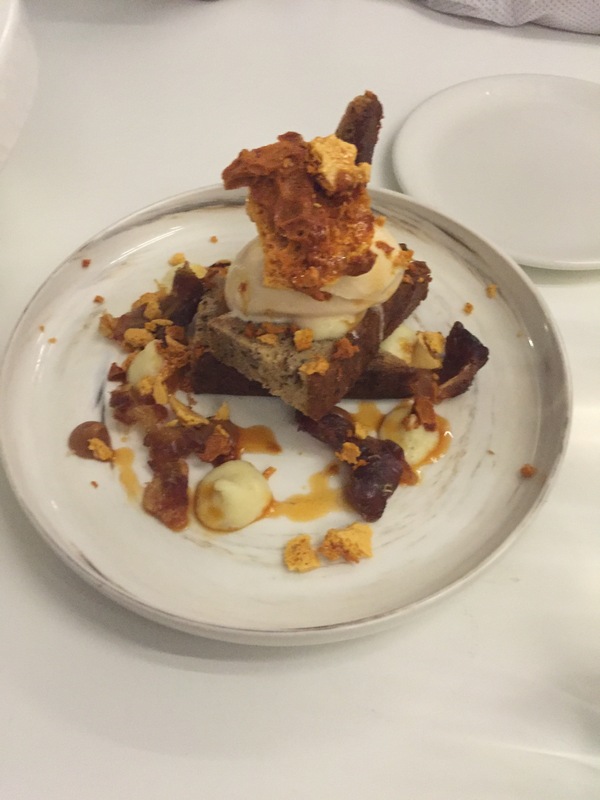 We also loved the indulgence of the banana and caramel, served with a house made honeycomb. 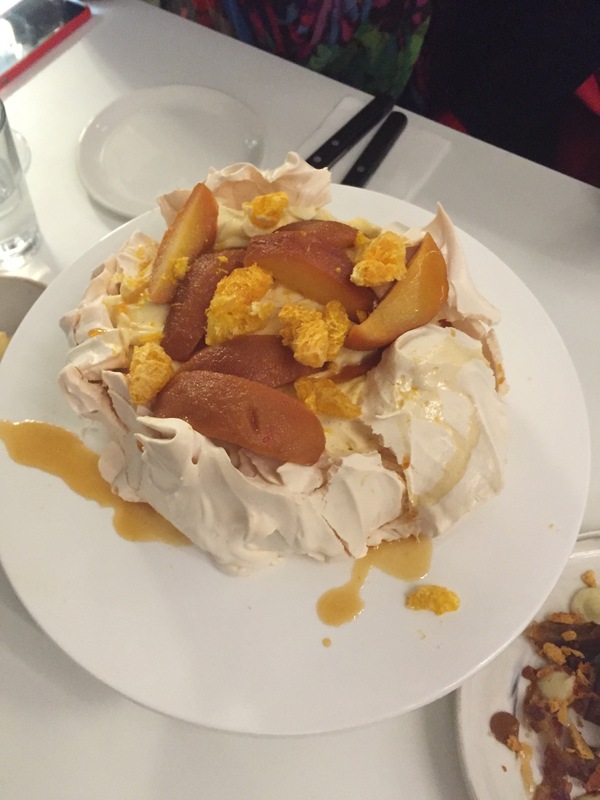 What really stole the show though was the pavlova. This beauty apparently serves two but we needed four to finish it off! It was the lightness of the dish and the best creme patisserie we ever tasted that made this dish shine! 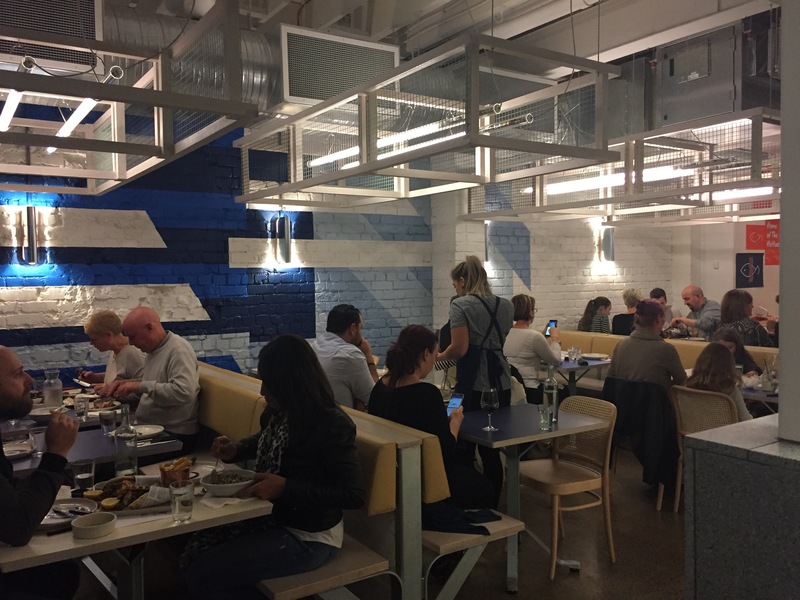 Hellenic Hotel are a great new addition to the Williamstown dining scene. We’ll be sure to come back to check out the sports bar upstairs and sample more from the menu! P.S. Here’s that photo I promised earlier! Fabulous descriptions- I was drooling at the pics , cant wait to try it. Were you invited here? If so where’s my invite (pun intented)?